Menger’s Sponge – named for its inventor Karl Menger and sometimes wrongly called Sierpinski’s Sponge – was the first three dimensional fractal that mathematicians became aware of. 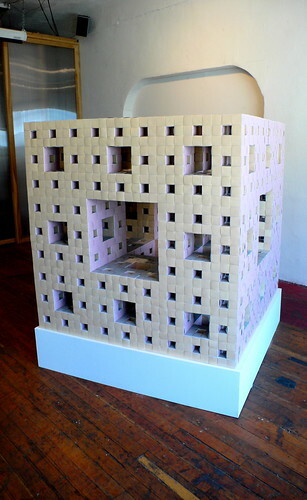 In 1995 Dr Jeannine Mosely, a software engineer, set out to build a level 3 Menger Sponge from business cards. After 9 years of effort, involving hundreds of folders all over America, the Business Card Menger Sponge was completed. The resulting object is comprised of 66,048 cards folded into 8000 interlinked sub-cubes, with the entire surface paneled to reveal the Level 2 and Level 3 fractal iterations. Recipe for a Menger Sponge: Take a cube, divide it into 27 (3 x 3 x 3) smaller cubes of the same size; now remove the cube in the center of each face plus the cube at the center of the whole. You are left with a structure consisting of the eight small corner cubes plus twelve small edge cubes holding them together. Now, imagine repeating this process on each of these remaining 20 cubes. Repeat again. And again, ad infinitum … To make a Level 3 sponge, stop after 3 iterations. The Sponge was very cool, but since my brain is not as much of a math brain as everyone else’s, I was perhaps more impressed by the vacuum suction ‘donations box.’ Consisting of a big, shiny red button, a clear vacuum tube running the length of the ceiling, and a transparent Plexiglas catch basin at the end of the line, the donations box itself is worth the price of admission (which is free). Press the shiny red button and your money will be sucked out of your hand almost faster than vision can follow. So cool that it will make you want to donate again and again. With a giant sucking sound. Here’s a view from inside the Menger. 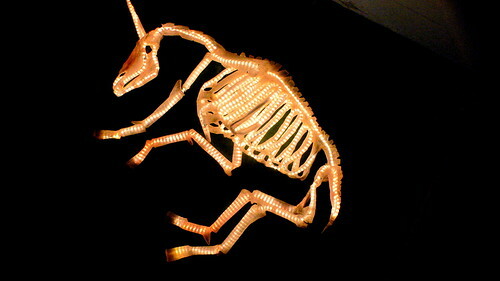 This glowing unicorn skeleton is the great secret of the Machine Project. I’m revealing it here, but you won’t see it at all when you walk into the storefront. Try to find it without first asking one of the volunteers working at the Project to let you in it’s secret location. 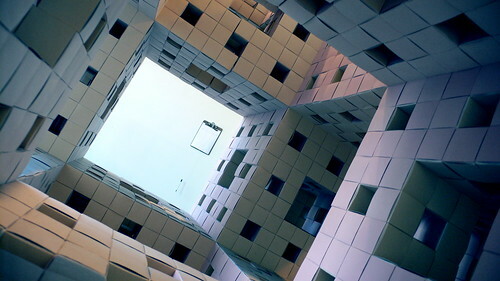 Link to the original Menger Sponge post at Boing Boing.